Summer heat is on its way, and energy prices are on the rise. With this combination of factors, most property owners are looking for cost-effective ways to lower their energy bills. To combat the heat of the sun without entirely losing your view, consider a solar screen. They are fabric screens mounted on the exterior of windows and doors, and they prevent 90% of sunlight from touching the glass of your windows, keeping your home’s interior cool and comfortable. You could even be extra energy efficient by using this Comparison Of Solar Storage Solutions and efficient solar panels! Here are 5 reasons why solar screens are the most highly recommended upgrade for home energy efficiency. Solar screens block UV rays 65-90%, preventing the sun from heating up your windows and your home. But the screens only block visibility 15% – 40% depending on fabric selected, so you still get plenty of light inside your home to keep your plants happy and healthy. If your home absorbs less heat from the sun, you will need to run your air conditioner far less to keep the interior comfortable. The energy savings from turning your air conditioner down even a few degrees is significant. When the air outside is cooler and you’d like to open your windows, solar screens will still provide protection from the sun’s harmful UV rays that can fade your home furnishings while allowing air flow, and can also help prevent insects from coming into your home while your windows are open. Solar screens are an extremely affordable option as far as window coverings go, especially for oddly shaped or very large windows. 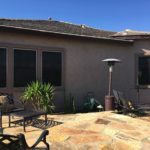 Solar screens are made of fabric that can easily be cut to fit any window or door in your home, and they are held in place with a simple frame and mounting hardware. 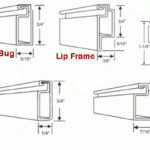 Another window treatment often used by homeowners to block sunlight and lower home cooling costs are insulated drapes. Solar screens are less expensive, do not contribute to dust in your home, are easy to clean and maintain, block the sun’s rays from the outside rather than the inside for greater energy savings, and still allow sun into your home. 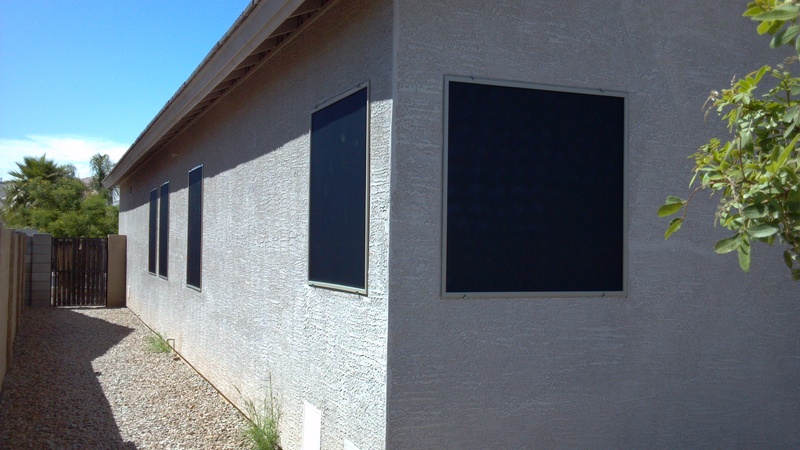 Prepare yourself for summer by insulating your home with solar screens. They will provide you considerable energy savings by keeping your home cool, allowing you to use your air conditioning far less often.